Winning at Cameron Indoor is not an easy task for the occasional visitor. Nor, for that matter, for most of the regulars who stop by annually by league mandate, facing their usually lethal dose of the Blue Devildom and the privileged, raucus Crazies. Unlike the 91-76 W there in ’83 by U of L’s national semi-finalists, who may have actually been the best Cardinal contingent ever, this year’s still raw squad gave its gutty all, but fell, 65-72. The Cardinals were led by The Future. After a lackluster opening half, sophomore Quentin Snider led the charge, during the Cards’ comeback after the break, when they steamrolled from a 15 point deficit to take the lead. Q netted a trey from the corner to cut Duke’s advantage to four. Then converted a +1 to narrow it to a single digit. Then another +1 at 6:12 for the lead, 58-57. Snider unfortunately was whistled for his fourth foul with 3:13 to play, and was removed from the game. He committed his fifth at 2:01, less than a minute after being reinserted into the lineup. Had he been able to run the show unimpeded by foul trouble throughout the game’s waning moments, who knows how it may have impacted the outcome? But, as they say, were ifs and buts candy and nuts . . . etc, etc. Sophomore Anas Mahmoud’s was a commanding presence at the defensive end. With three blocks, he controlled the middle. 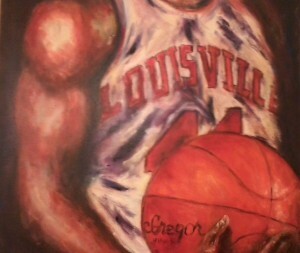 Plus he tallied a key deuce during U of L’s 13-0 run that pulled them back in the game. Freshman Ray Spalding played his best game on the road, giving no quarter underneath. 8 points. 6 rebounds. Two steals. And was the team’s +/- leader at +9 in 24 minutes of action. Donovan Mitchell was all that and a bag of chips, leading Louisville in scoring with 17 on 7/11 shooting. So, yeah, The Future is, you know, so bright . . . that’s right, sing it with me . . . you gotta wear shades. Chinanu Onuaku was never present. He seemed unnerved by Marshall Plumlee’s intensity. The Duke pivot man was mean. Onuaku was meek. And continued to commit stupid fouls. Team-wise, Louisville gave up too many drives to the hoop. The Blue Devils effectively spread the court, allowing several uncontested bunnies at the rim, and as many open inside/out threes. In an unusual college basketball season, one where experience is trending nationally, a regular season ACC title, while a worthy goal, is somewhat of a pipe dream for this immature Cardinal squad. Which brings me to the hippopotamus in the room, Rick Pitino’s quandary for the final seven games of the campaign. Does he continue to give an abundance of PT to Damion Lee and Trey Lewis? Or, does he allow Q to be the ringmaster, Mitchell his wing man in the backcourt, and give Deng Adel way more valuable court time than he has since the rookie has recovered from his injury? While I don’t mean to diminish the importance of the Cards’ done&one grad transfers, without whose presence and leadership this squad would have been adrift, I must ask: Isn’t it time to acknowledge that Louisville is really playing for next season and beyond? And grant court time accordingly? Last night in Durham, Lee seemed overwhelmed by the environment. Not only was he 3/15 from the field, time and again being unable to finish at the rim, he proved not ready for prime time late. When Louisville had its first possession with a chance to take the lead after that second half surge, Lee jacked up a quick, contested and thus ill-advised three. He misfired on another couple of longballs in the final minute, when driving to the dish should have been the modus operandi. Yet, despite his mediocre performance, Adel only saw two minutes of action. That makes no sense to me. Give the neophyte some invaluable action under real combat conditions. Trey Lewis played better than his counterpart, scoring a dozen. But he continues to try to dribble his way to nowhere, Horizon League style, to detrimental effect. How Pitino decides to go in this regard the rest of the way is, to me, the most fascinating aspect of the rest of the season. Being an old fart traditionalist, I love the style of the Cards throw back uni. But I despise that the road version is black. Yes, black, along with red, is an official school color. But, for decades, U of L’s road unis were primarily red, leaving the black ones to rival Cincy with the same school colors. At some juncture, when black garb became all the rage, Louisville trotted its version out. I forget the exact season, but the unveiling was road game at Georgia Tech, a tilt the Cards should have won, but didn’t. The fan base as a group immediately decried the break from tradition. There were any number of black is black Ls to follow, before U of L finally won a game thusly garbed. The Cardinals did not lose last night because they were wearing black. Next up, another road trip to a place that’s not so much fun for visitors. I hope Pitino takes Ray Ganong with him. I thought about mentioning Johnson’s lack of contribution, but decided against it, since Mahmoud and Spalding more than made up for it. I, for one, love Ganong’s over the top, frothing at the mouth intensity. Totally agree with you regarding Ray G. I had direct observation of his passion, commitment and skills as a motivating trainer in the strength and conditioning program from when he replace the prior coach (up midway through RP’s 1st season). There was the rare player that he could not motivate to work for self-improvement. Passion, commitment, etc… are wonderful qualities. It’s Ganong’s frothing at the mouth intensity that’s worrisome. He’s gonna blow a gasket. Indeed, BlinLuck, could happen. But that’s an issue between Ganong and his cardiologist. Seedy, last night was the first time I can remember ever really “seeing” Ray Ganong. I knew the name, that he was the Cards’ strength coach, and I’ve heard that he’s good at what he does. I also knew someone set out the chairs for players during timeouts. I just never made the connection until last night’s Duke game. I thought Ganong made a spectacle of himself on Big Monday and national television. I tuned in to watch a college basketball game, not Ganong’s featured performance on the bench. I thought he looked like a jackass. Does anybody else think that the post-season ban took the edge off the game? Usually I would have been sitting on the edge of my seat screaming at the Ref’s, coach K, or the evil Dr. Allen Greyson who will rue the day he tripped my man Spalding when he arrives at the YUM center in less than 2 weeks. Unless, that is, my give-a-shitter completely goes away by then. Which is quite possible, unfortunately. Well, Ganong’s just real intense. Always has been. It’s who he is. When he was football strength coach, he’d get in a hands on knees stance every single play along the sideline. It’s simply his way. He didn’t ask for the attention. ESPN just focused its cameras on him for a bit, and Bilas commented on his intensity. Like I said, I love it. And I’m glad he has the stools to squeeze. Otherwise, he might hurt himself or whoever is sitting next to him with all that nervous energy. Your take (as usual) seems very reasonable. I should probably lighten up a bit. JGJ, I found myself as intense as usual, as soon as the Cards started to make a game of it. As soon as that Dukie tripped Ray, I screamed at my TV. I was grousing when Spalding missed a couple in close, and defaming Lee as a mid major wannabe when he jacked up those ill advised treys. But, overall, there is a different feel to the season. And, as I wrote, different perspective on strategies as to how to proceed, playing time wise. I wish I could un-curb my enthusiasm…. Umm, you threw me off there for a second Seedy when you mentioned Ganong squeezing his stools ! Anyway, once the game started my crowd at the Bambi got into it and all the other distractions were forgotten. That’s the way it’s going to be for the rest of the games also. Can’t wait for the emotions of Senior Night against Tech on 01MAR.